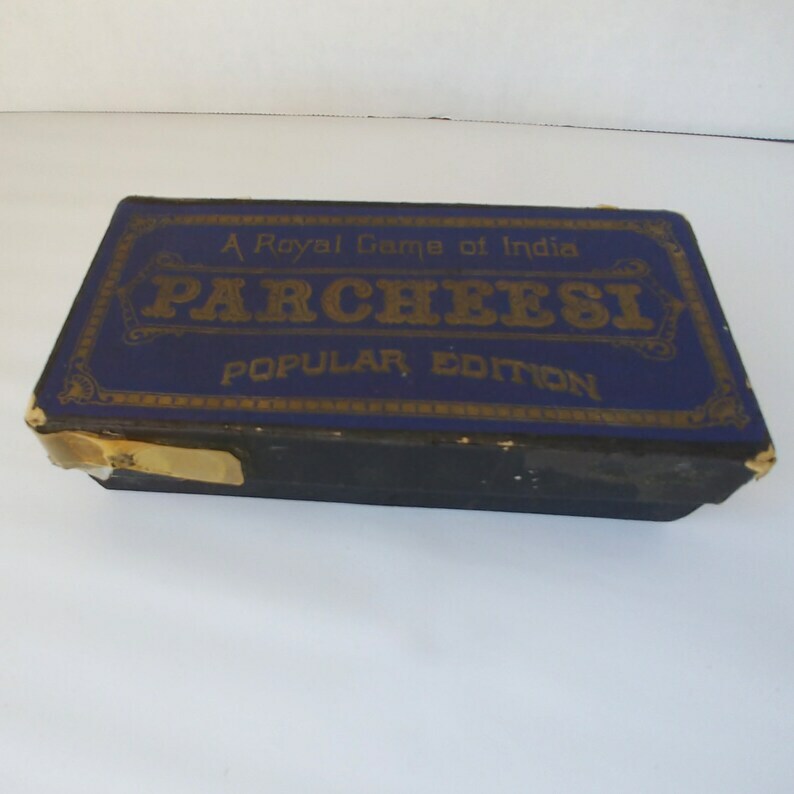 This “Royal Game of India – Parcheesi” game box includes four black cardboard dice throwers, one red and white die and 16 metal-rimmed disc in blue, green, yellow and pink. The blue and gold box, though showing wear and old tape on the sides, still features the vintage typography and graphics on the top. The box is 6 ½ inches wide by 3 1/8 inches by 1 ½ inches. CONDITION: The box top has split on the corner edges and there is cellophane tape attached to the top and the bottom of the box. The dice throwers are very well worn and one is taped. The game pieces all have some color worn away. No instructions are included. 1950s Snare A Card Game, Boxed Vintage Game Cards, Letters, Whitman Publishing Co.
Super speedy shipping, great packaging, album just as described. Perfect order in every way! Thank you. Payments are accepted via credit card and PayPal. Full refund is provided for orders cancelled before shipping. All sales are final. I will do my best to accommodate any needs for returns based on specific circumstances. Please contact me to discuss before shipping. Items ship from Toledo, Ohio, to U.S. addresses via USPS.